Please include any information you think we should know. You will have 2 more opportunities during check-out to tell us about your design. If you use this first text box, you don't have to use the following two boxes. You will be asked to fill in your name and contact information during check-out. Select ... $200.00 - $350.00 $350.00 - $500.00 $500.00 - $800.00 $800.00 - $1,200.00 Other - please specify in the description. 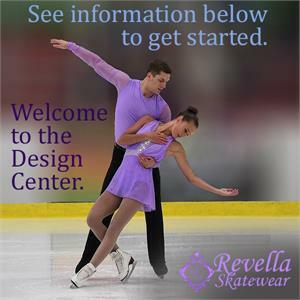 Revella Skatewear will help you create your next garment! Get the custom figure skating dress or ice skating costume you have always wanted at an affordable price. Our extensive design service allows for a level of creativity you have not experienced before! Be involved in the design process as little or as much as you want - we can work from your music to create for you, or we can work from your ideas and sketches. If you are new to the design process, we welcome you to this wonderful experience! Feel free to provide a budget for your design. We accept music and sketches sent in through the email, or postal mail. Please keep in mind that all materials sent in will not be returned to you. Be sure to include details such as: if the skater prefers a sleeveless costume, a color preference, etc. Please allow 3 - 10 days before you receive each design / revision. Please feel free to contact us at any time with questions or additional information. Please read the entire description of your designed garment carefully. It is the customer’s responsibility to read and understand the description. If you have any questions about the description details, style, fabrics, colors, or crystals, please contact us. Once the design is approved and purchased, any requested changes by the customer could result in additional fees. The $25.00 fee for this service allows you to receive up to five revisions per garment. This service must be purchased each time you have a new garment to be designed, or if your design revision quantities exceed five per garment. Each design is an artistic rendering of the garment to be made and includes but is not limited to: color, pricing, fabric suggestions, crystal suggestion and other recommendations. The image of the design is in no way intended to be an exact indication of the finished garment with regards to: proportion, color (as displayed by your monitor or printer), fit, quantity or size of crystals. A written description will be provided with the image and both items will be sent to the email address you provide. Free fabric samples will be sent via U.S mail to the mailing address you provide. Under no circumstances will the Design Center Fee be divided between garments with the exception of team orders where all garments are identical. The Design Center Fee is not refundable even if the customer receives fewer than five designs per garment, or if the customer is dissatisfied with the designs. The Design Center Fee will not reduce the price of the garment that is being designed. The Design Center Fee will not reduce the price of the Custom Fit Fee if the customer orders a custom fit. Even if the customer supplies their own sketches, photographs, or description; they must purchase the Design Center Fee to begin working with Revella Skatewear on their design. You should expect this process to take a minimum of 3 months to go from purchasing this service to finished, ready-to-ship garment. While it is possible to work with almost any budget, a low budget of $250.00 or less, will likely result in a simple design; and not include one or more of the following: the Custom Fit service, crystals, appliques, airbrushing, hand-created details, or special order items or fabrics. While we carry a large selection of fabric colors to choose from, we are happy to special order other colors as needed per design for an additional fee. Please keep in mind that the color of the fabric that you are requesting has to be available in order to be special ordered. An alternative to our Design Center service is our Alterific service. You may find what you want with Alterific! Please send in your skater's measurements, and we can assist you with selecting a size because designed garments cannot be returned for a refund or exchange. Please read our return policy for more details. If you already know your skater's size, please include that information in the design notes. Due to the frequent request of common details such as a sweetheart-shaped bodice, Revella Skatewear does not guarantee that any particular design is exclusive to any particular customer. We reserve the right to refuse any design request for any reason. Enjoy our creative process as the best part of your skating experience for having your skater dress, figure skating dress, competition ice skating dress, designer ice skating dress, ice skating costume, testing ice skating dress, practice ice skating dress, and all your skatewear made for you. From practice ice skating dresses to competition ice skating dresses, our collections offer the best in skatewear.